The Uni knot lets any fisherman learn just one simple knot and adapt it to any application. This knot works for everything from tying a hook to your line to attaching line to your reel. The Uni will provide very good knot strength in most applications. 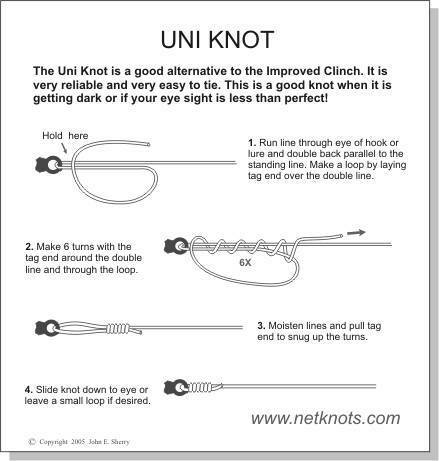 For the fishermen looking for the easiest way to handle all their knot needs, the uni is the only knot you will need to learn. The Uni works well with any type of line and it is far and away the best way to tie knots with the high strength and small diameter braided lines. 1. Run the line through the hook eye, allowing 6 to 8 inches of line to form the knot. 2. Form a loop with the tag line end. 3. Wrap 6 times inside the loop you formed in step 2. 4. Lubricate and pull tight.